Comment: Isaiah proclaims that “the desert shall rejoice and blossom…it shall blossom abundantly.” This is just one of many signs that “God’s grace…reaches to all of creation”, as Noel Leo Erskine writes (Feasting on the Word, Year A, Volume 1, pg.50).This grace is evident in both a transformation of the earth, as well as transformation of the broken people on earth. In The Curious Garden, a little boy, Liam, only sees a dirty, lifeless city around him—that is until he discovers a secret, struggling garden. He cares for it and it begins to spread until it reaches the entire city, blossoming abundantly, just like the desert Isaiah describes. Liam spreads new life to his surroundings through the care of his blooming garden, and new life is given to our surroundings by God’s blooming grace. Comment: It would be easy for the community receiving this letter to give in to grumbling and impatience as their wait for the Lord’s return seems to take a long time. The harder, but worthier, route is to resist such grumbling, and to be strong and patient, even while waiting so long—just as a farmer is patient with the crops. That is the key: it is not patience without reason, but patience with benefits—we choose to live a certain way in this world, because we see “a new world coming”, as Joanna M. Adams writes (Feasting on the Word, Year A, Volume 1, pg. 67). The certainty of that wonderful future directs how we live with one another now. 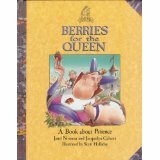 In Berries for the Queen: A Book About Patience, the queen’s impatience at waiting for the strawberry crop leads her to grumble, complain, punish, and alienate almost everyone, before she learns a better way! Our own impatience could lead us to grumbling and fighting, but we, like, good farmers, wait for the precious crop of our Lord’s return, with strength, and patience. Comment: In typical fashion, Jesus doesn’t answer John’s question about whether or not he is “the one who is to come”, with a simple yes or no. Instead, Jesus answers John by describing everything he’s been doing and that has been happening around him: the blind see, lame walk, deaf hear, lepers healed, dead raised, and the good news is preached. For Jesus, his actions tell John who he is, and answer John’s question. In The Bravest Dog Ever: The True Story of Balto, we find out that Balto is a brave dog by what he does—he helps carry medicine for over 50 miles on a sled, after the train transporting it breaks down. Balto travels far in freezing cold conditions, because this delivery is so important, and that action tells us who he is: a brave dog. In the same way, Jesus could have simply said “Yes, I am the one who is to come”, but chooses, instead, to let the miraculous actions he performs speak for themselves. The Lectionary Links this week are written by Union Presbyterian Seminary alumna Sara Anne Berger, pastor of the Whitmire Presbyterian Church in Whitmire, SC. Lectionary Links: Sunday, December 15, 2013 by Storypath is licensed under a Creative Commons Attribution-NonCommercial 4.0 International License.